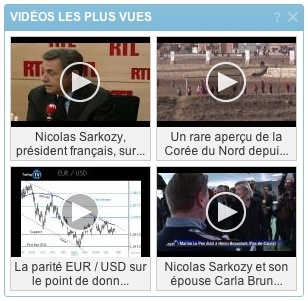 We’re happy to announce another new customer in France today as Boursorama.com has deployed Video Cloud to deliver online video coverage of economic and financial news. One of the country’s leading information portals*, Boursorama.com provides news, analysis, stock market prices, and aggregated video content from major French and foreign partner news feeds. Boursorama.com chose Video Cloud as its online video platform following a site redesign late last year, during which the organization made the decision to increase the role of video as part of its content aggregation strategy. Video Cloud met its requirements for a robust, fast, and simple platform that could centralize multiple feeds and metadata in a single, shared interface. Boursorama.com is using Video Cloud to centralize management and delivery of its aggregated video content. Since introducing the new video format in January 2012, Boursorama.com reports that site visitors have already viewed more than one-million videos, and expects those figures to increase as it continues to aggregate fresh content. With viewing on the rise, Boursorama.com made the move to incorporate advertising capabilities this April. Boursorama.com is the latest in a growing number of leading French organizations using Brightcove, including Groupe Sud Ouest, Prisma Presse, L'Express, Le Figaro Group, Audi France, Société Générale, and Roche. *Boursorama.com considers itself one of France’s leading information portals with 11 million unique monthly visitors (source: Google Analytics, March 2012).